WE are celebrating the independence days of Pakistan and India in August, but there are bitter memories in the eyes of those who saw the events unfolding at the time of the first independence-day. Surinder Kaur was one such witness to the horrors of partition of the Indian sub continent. During the nineties of the 20th century, two of Surinder Kaur’s daughters got settled in New Jersey, USA. She used to visit America during the summers each year. Outside her own family members and those of her older sister Parkash Kaur, the only people she would often call on were Iqbal Mahal of Toronto and myself, because we were among her biggest fans in North America. Once I asked her about her childhood and the formative years, she started talking about the partition of Punjab. Here is what she told long before her death in May 2006. Surinder Kaur was born in 1929, but I know from my sources that she was older than Lata Mangeshkar and was born in 1927. I am telling this because I want the history to be recorded the way it was. According to Surinder Kaur her older sister Parkash Kaur was nearly a decade older than her. Their father’s name was Bishan Dass. He was a conservative man. He never liked his daughters singing in public. Parkash Kaur had a enchanting voice and a natural twist in her voice made singing easy even for difficult classical tunes. Lahore was the cradle of Punjabi culture. It was home to a large number of folk songs and folk tunes. Parkash Kaur had mastered a lot of them from older ladies of her locality. Parkash Kaur was a very popular invitee to every wedding or engagement ceremony within their extended family or you can call it the clan. Parkash Kaur used to take Surinder Kaur or even Narinder Kaur to accompany her to the weddings. They learned to sing in unison and the people liked it. Soon even the strangers used to invite them and were willing to pay them also, which was a rarity during those days. Parkash Kaur’s family objected to it, but as her demand increased, the family relented. Parkash Kaur became the first radio singer in the family around 1940. Surinder Kaur followed her in 1943. Perhaps on August 31, 1943, Surinder Kaur was auditioned as a casual artist at All India Radio Lahore by Jeevan Lal Mttoo, the in charge of music. Surinder Kaur had no training in classical music. Mattoo selected her in spite of this drawback. He knew that even Amritsar born Shamshad Begum had no training in classical music, still she became a very accomplished singer. Surinder Kaur had similar potential. Even Parkash Kaur had no training in music and she was singing professionally. So Surinder Kaur was approved and she sang her first two songs on that special day. Mohammad Rafi started as a radio singer in March 1943. Surinder Kaur’s voice was appreciated by one and all and her demand increased. Master Inayat Hussain, a freelance music director invited Parkash Kaur and Surinder Kaur to sing a couple of songs under his music direction. After repeated rehearsals both the sisters sang very professionally. These first songs were “Haaye na wass oye naa wass baddlaa aje na wass oye kaaliya” and “Dhol sipahiya we kithe giyon dil laake”. These songs became instant hits. By 1944 Ghulam Haider had shifted to Bombay. Pandit Amar Nath remained the reigning music director in Lahore. His favourite singer was Zeenat Begum. Surinder Kaur said that whatever Pandit Amar Nath used to compose for Zeenat, she (Surinder Kaur) tried to copy it and sang it repeatedly. This is how she became a singer. Soon there after Master Inayat Hussain composed another soul stirring tune for Parkash Kaur and Surinder Kaur to sing as a duet. The song was “Maawan te dhiyan ral baithian ni maaye koi kardiyan galloriyan, ni kankan lammiyan dhiyan kyon jammiyan ni maaye”. It was recorded in two parts, which are featured on the two sides of the same disc. This record sold like hot cakes throughout the Punjab. Zeenat and Shamshad Begum had shifted to Bombay. The vaccum left in Lahore was filled by the two sisters, Parkash Kaur and Surinder Kaur. Budh Singh Taan was another versatile maestro. He could shift roles between a music director and a radio singer. Bhai Santa Singh and Bhai Samund Singh were the leading Sikh religious musicians and Budh Singh Taan was the third such musician at All India Radio, Lahore. He is credited with the recording of the first ever complete “Asa Di Waar”. Budh Singh Taan did not record it in Lahore’s own “Jeno-phone Studio”, which had its own music director and orchestra, but he went to Bombay to record it in the studios of newly opened “Young India Recording Company” in Wadala, Bombay. Budh Singh Taan composed two tunes of Shabads for Surinder Kaur to sing. One of Guru Nanak’s Shabads was “Vaid Bulaya vaidgy, meri pakarh dhandole baanh”. This record also sold very well in Lahore and Amritsar. Surinder Kaur was by now basking in the glory of her well recognized talent and she enjoyed every bit of it. It never occurred to Surinder Kaur that anything untoward could happen. She was making more money than the male members of her family. Sister Parkash Kaur was also doing very well. By 1945, the people in the streets were talking about the creation of Pakistan and Lahore becoming a part of it. Surinder Kaur was very naïve; she never thought anything untoward could happen in her loved city. The property values were rising by leaps and bounds and the main buyers were the wealthy Hindus of Lahore and Amritsar. Surinder Kaur and Parkash Kaur were minting money in music. They had hired a harmonium player and a dholki player to accompany them on the pre-wedding musical programmes. Surinder Kaur got the scare of her life, when she heard that in March of 1947, hundreds of innocent Sikhs were burnt alive in a Gurdwara in Rawalpindi district. This stunning news created tension in Lahore too. The property values started tumbling down. A lot of people lost their life’s earnings during this down trend in real estate prices. Some people still believed that Lahore will fall into India’s share. The city had more Hindu and Sikh population and even in the villages most land was owned by them. A large section of the press was pleading for Lahore’s inclusion in India. By the beginning of August it was becoming more and more clear that Lahore will fall into Pakistan’s share. Pakistan became independent first and Lahore was included into it on August 14, 1947. Overnight All India Radio Lahore became Radio Pakistan Lahore and the tone of the radio and pro Pakistan newspapers changed. Surinder Kaur’s family was in panic. They had to move quickly out of the city. One “Mohalla” of Lahore inhabited entirety by the Hindus was set ablaze. Some people perished in the inferno, others left in a jiffy. A lot of Sikhs were killed in gun battles and in attacks with sharp weapons. The Lahore Amritsar Highway was the bloodiest. A report was spread that the “Hall Bazaar” in Amritsar, which was the stronghold of wealthy Hindus was also torched. The family of Surinder Kaur and Parkash Kaur decided not to go to Amritsar, which was the nearest city, but to go to more peaceful Ferozepore. The family, without much to carry along joined a “Qaafila” to Kasur and Ferozepore. The caravan was moving slowly. On both sides there was stench of death. Some more people joined them on the way, they were telling stories of cruelty and wanton destruction. Not even the old or the very young were spared. The stories emerging out of Gujjranwala, Sheikhupura and Nankana Sahib were the most heartrending. We were dumb-folded. But we were also told that the situation in the Lahore Wagha section was the bloodiest. Somehow we crossed Kasur and approached Ganda Singhwala. On reaching Ganda Singhwala, we heaved a sigh of relief. Ferozepore was only seven miles. There were signs of India approaching. There were hordes of burly Sikhs moving towards Ferozepore. These folks also joined. A few steps from Hussainiwala were the Indian border. The sooner we reached the Indian Territory, smiles returned on our lifeless faces. We were seeing a lot of grim faces of the Muslims heading to Pakistan. What a madness it was? Our departing Muslim brothers needed sympathy, which we surely wanted to express, but could not. The times were such. At one time we were given a lot of love by our Muslim brethren in Lahore, but no one could guess how all of a sudden such a change in mindset could happen. On reaching Ferozepore, we discovered that life was a lot better in Lahore. We were much less in demand in Ferozepore, at times we had to sleep without food. As September approached, we discovered that in Pakistan, the violence had subsided, but in Amritsar, the frenzy was on the increase. 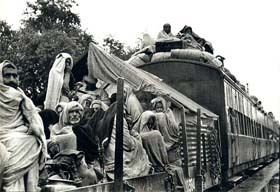 In the beginning of August East Punjab was peaceful, but after 15th of August, when train loads of dead had arrived at Amritsar’s Main Railway Station, the people in the villages got out of control. Even the government could not calm them. Ferozepore was comparatively a lot more peaceful. Surinder Kaur stayed for a few months in Ferozepore, and then suddenly a message came from Bombay that Master Ghulam Haider wanted to feature Surinder Kaur’s voice in film “Shaheed”. D.N. Madhok offered her living accommodation.